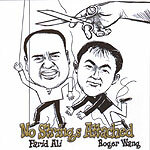 CD review: "No Strings Attached"
Every time we hear from Roger Wang, he ends up mesmerizing us anew. One of the very best jazz-inflected guitarists playing today, his solo album and duo outing with singer Mia Palencia, plus a Christmas album the two of them did last year, have left our ears tingling. What's that? You've never heard of Wang? Hmmm ... Well, see, he hails from the island of Borneo, part of Malaysia. Doesn't have a U.S. distribution deal. Doesn't tour here stateside. But his new album with fellow picker Farid Ali is as good as anything any U.S. jazz guitarist will issue this year, and better than all but the very best will put out. With Ali switching between guitar and Malaysian gambus (a kind of fretless lute apparently related to the Arab oud and Turkish ud), the two men run through a fun set mixing their own compositions and covers of Duke Ellington ("Caravan") and Burt Bacharach ("Close to You"). The easy groove coupled to masterful musicianship that crosses back and forth across all stylistic boundaries recalls the classic sessions of guitarists like Herb Ellis or Chet Atkins. The jazz motif is dominant, but country-western and blues make their presence known  as well as Malay, Chinese, Indian and Arab sounds from the men's southwest Asia/pan-Pacific surroundings. All of these elements combine to create a sound that is both fresh and new while still being very much familiar and comforting. It's the sort of CD that just kind of nestles into your stereo system and doesn't every seem to stray too far from the CD player.